Award-winning spas offer ancient rituals with indigenous products. Surrounded by breath-taking mountains, soothing ocean breezes and a relaxing calm that permeates the island culture, a visit to Maui is not complete without indulging in at least one rejuvenating spa treatment. The word maui actually means “life, alive, to live” in the Hawaiian language. To the early peoples of Hawaii, the earth, the sea, and the mountains were all intertwined with a person’s health and well-being. Embracing that same philosophy today, Maui’s spas offer many indigenous treatments that have been passed down from generation to generation. 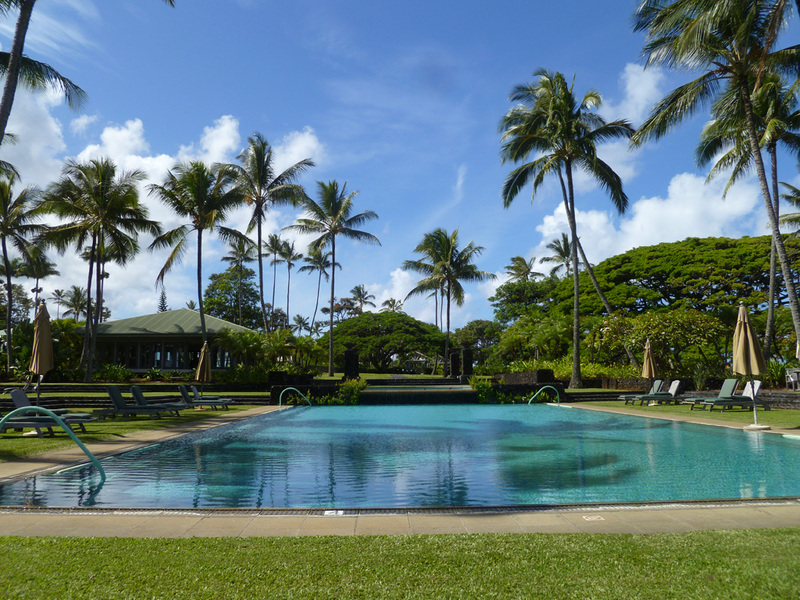 Located in the town of Hana on the eastern tip of Maui, Travaasa Hana is a sanctuary of peace and tranquility. Arriving at Travaasa Hana after my day’s drive on the famous highway, I settle into my Sea Ranch Cottage, which is reminiscent of a beach cottage of an earlier and gentle era—no clocks, radios, TV, or air conditioning, but so charming and inviting with a spectacular ocean breeze and view. I can immediately tell this is not a busy, bustling resort, but rather an oasis of peace. 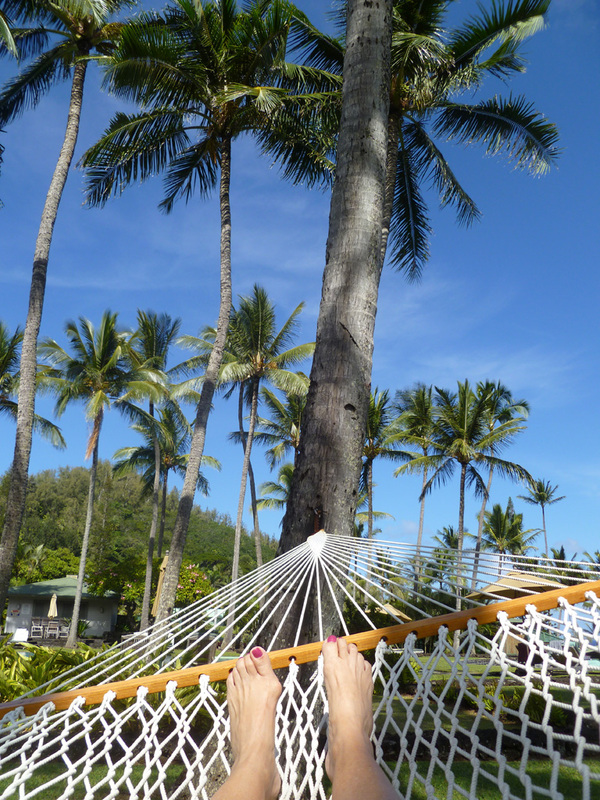 My stress begins to melt away as I enjoy the serenity of the outdoor infinity pool and whirlpool and then sink into one of the hammocks suspended between the tall palm trees. Tomorrow I will participate in an early morning yoga class, one of several fitness classes offered at Travaasa Hana, but today I look forward to my massage at the famous spa. The Spa at Travaasa Hana was voted the #1 Resort Spa in Hawaii in the 2012 Conde Nast Reader’s Choice Awards. Since no cars are allowed at the resort, I’m escorted to the spa via a golf car. After arriving and signing in, I explore the outdoor area while enjoying a cup of herbal tea. 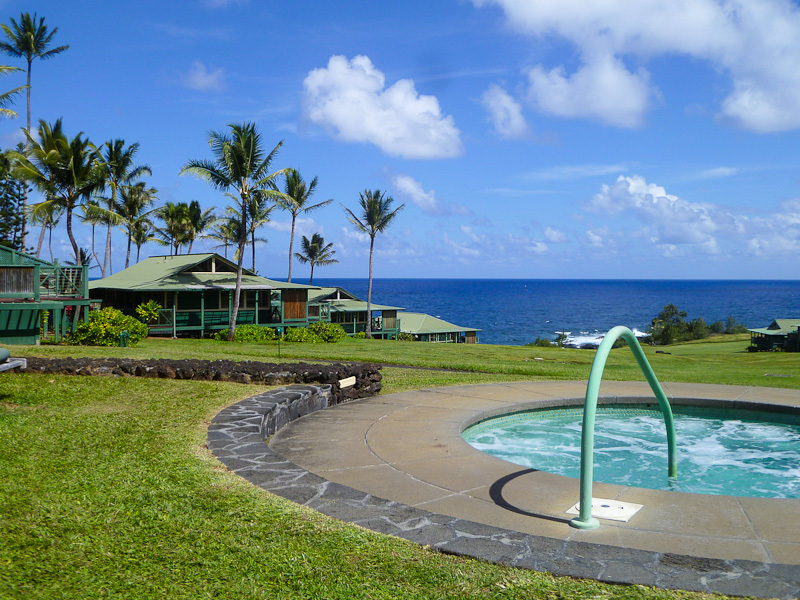 The most stunning aspect is the lava-rock whirlpool and garden setting with lounge chairs that overlook Hana Bay. After a soak in the whirlpool, I sink into the comfortable lounge and am almost lured asleep by the quietness of my surroundings. My therapist arrives and I’m escorted to my treatment room where I enjoy a signature massage by my native Hawaiian massage therapist. He explains that in the traditions of Hawaii, smooth heated stones used in the Pohaku Wela Hot Stone Massage apply the elements of earth, air, fire and water to achieve a healing, centering, rejuvenating treatment. Ho’a’ala (to make fragrant) Aromatherapy Oil can be added to any massage treatment. Other popular treatments include the Ho’ala (to arise) Refining Clay Body Wrap in which pink clay, blended with organic myrtle, sandalwood, lemon, sea algae and wild rose is used to heal, cool and regenerate the body. ‘Anainai Pa’akai (To scrub with salt) Sea Mineral Salt Scrub is a perfect add-on to any massage. Using unrefined, mineral rich sea salt, the skin is gently buffed, leaving the body silky smooth. Kapalua Spa located at Kapalua Resort, Kapalua, HI. 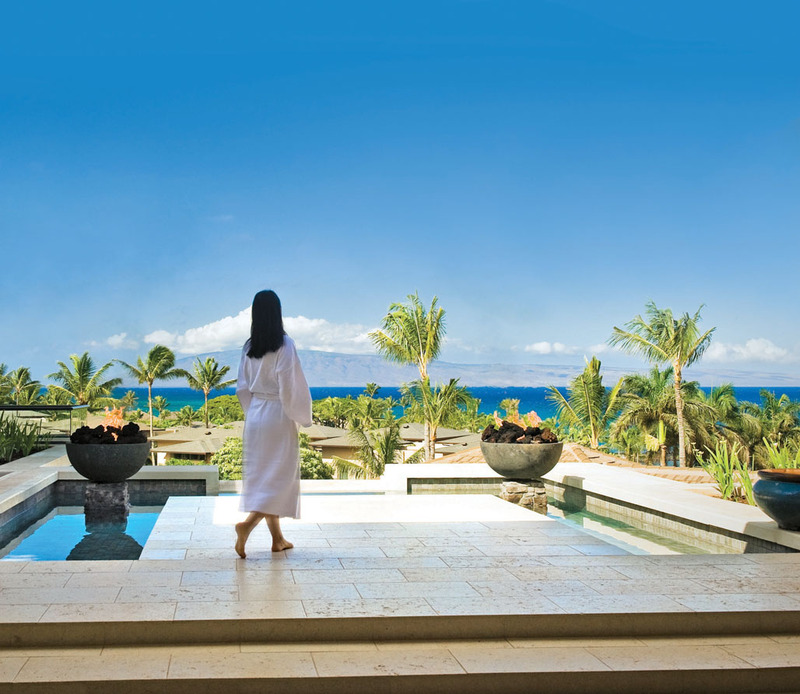 Surrounded by breathtaking views of the West Maui Mountains and sparkling turquoise waters of Kapalua Bay, this 45,000 square-foot, three-story spa is the winner of the “2012 Best Luxury Destination Spa” for the United States. The spa perfectly integrates a peaceful Mauka (mountain) to Makai (ocean) experience. Customized treatments have been developed using indigenous ingredients grown in the West Maui Mountains. The “butterfly logo” of the Kapalua Spa symbolizes its metamorphosis from a former pineapple plantation into a one-of-a-kind luxurious wellness facility. The spa includes an indoor/outdoor treatment areas including sea salt eucalyptus steam rooms and cascading waterfall hot tubs, outdoor hydrotherapy circuit, a salt water infinity pool and sunning deck, a state-of-art Fitness Center & Movement Studio, Spa Café, Spa Boutique and Beauty Salon. (1) The ‘Awa Drinking—the ‘awa ceremony was endorsed by chiefs to create open space for communication and gratitude. (2) Hawaiian Sea Salt—In the steam rooms, Hawaiian sea salt (which has been harvested from the waters of Molokai) are infused with essential oils. Guests deeply breathe in the healing powers of the sea mist to relax, detox and let go. (3) Gracious Fond Farewell—Kapalua Spa offers guests a farewell seashell memento which they are invited to fill with inspirations and memories from their spa journey. 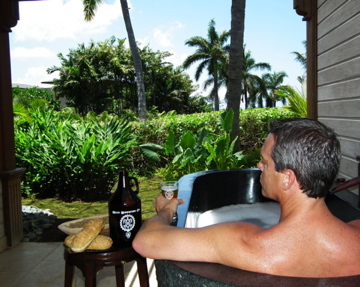 (2) Beer Baths, one of Europe’s most popular and therapeutic spa treatments, has come to Maui! Long known as a specialty of the famous beer countries like Germany, Austria and Czeck Republic, Beer Baths have been used as a curative, medicinal treatment in addition to relaxing and detoxifying experience for the body. Soaking in an outdoor stone-carved tub full of beer ingredients from Maui Brewing Company’s handcrafted products is definitely a unique experience. A distinctive aroma of hobs and malt assails the nostrils as foam rises from the bottom of the tub, similar to a head forming on a giant mug of beer. As an added treat, the therapist will bring a Kapalua Spa Brew (non-alcoholic) accompanied by Beer Bread baked locally and a spread of homemade honey mustard Beer butter! (3) Journey through the Ocean Massage is a full two-hours of pure relaxation. It includes a marine exfoliation, face, hand & foot massage and a luxurious four-hand synchronized massage performed by two therapists with lomi sticks and hot rocks. Wherever your Maui adventure takes you, be sure to take time to relax, rejuvenate and enjoy one of Maui’s luxurious spas! To read the Luxe Beat Magazine version of this article click on the title Maui’s Unique Spa Adventures. Sandra Chambers is currently a freelance writer for Allegiant Air's in-flight magazine, Sunseeker, Luxe Beat Magazine and FWT Magazine (Food, Wine, Travel Magazine of the International, Food, Wine & Travel Writers Association). She has also written for West Jet Airlines’ inflight magazine Up! ; Healinglifestyles.com; Dreamscapes; Wrightsville Beach Magazine, Lumina News, North Brunswick Magazine and South Brunswick Magazine among others. Sandra is a member of the International Food, Wine & Travel Writer’s Association (IFWTWA) and Cape Fear Camera Club. She lives in Wilmington, North Carolina, and enjoys traveling, photography, reading, seafood and all things Southern. Her travel blog, Southern-Traveller.com, features destinations in North and South Carolina, Georgia, and Florida and beyond.